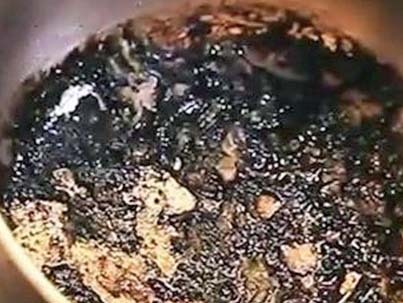 Caring for your Instant Pot will keep your appliance looking new and performing at its best. 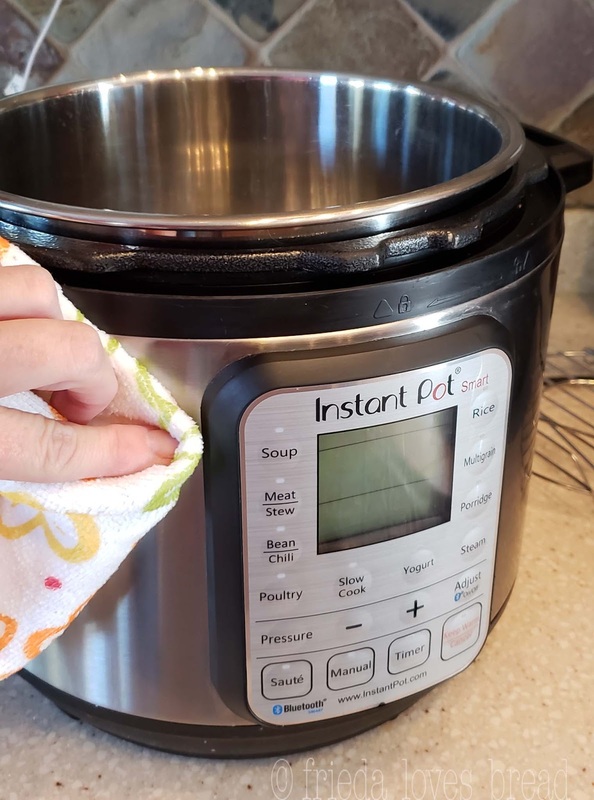 Here's the complete guide for cleaning all the parts of your Instant Pot, inside and out. 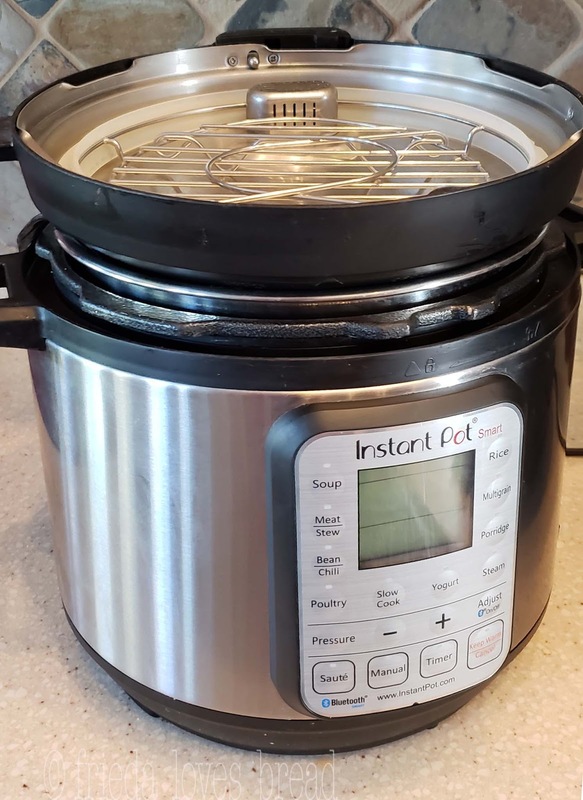 I have had my Instant Pot Smart pressure cooker for over two years, use it a couple of times per week, and it has a permanent spot on my kitchen counter. My stainless steel pot scorched. It was black, dark & ugly. 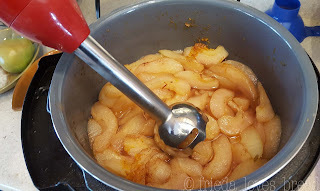 I was making Vanilla Spice Pear Butter and was reducing the sauce using the Saute setting. I was supposed to use Saute Less, but had it on a higher temp, Saute Normal. I love using my ceramic non-stick pot for this recipe, but this time, I used the stainless steel inner pot. Big mistake. It was black, bad, and ugly. 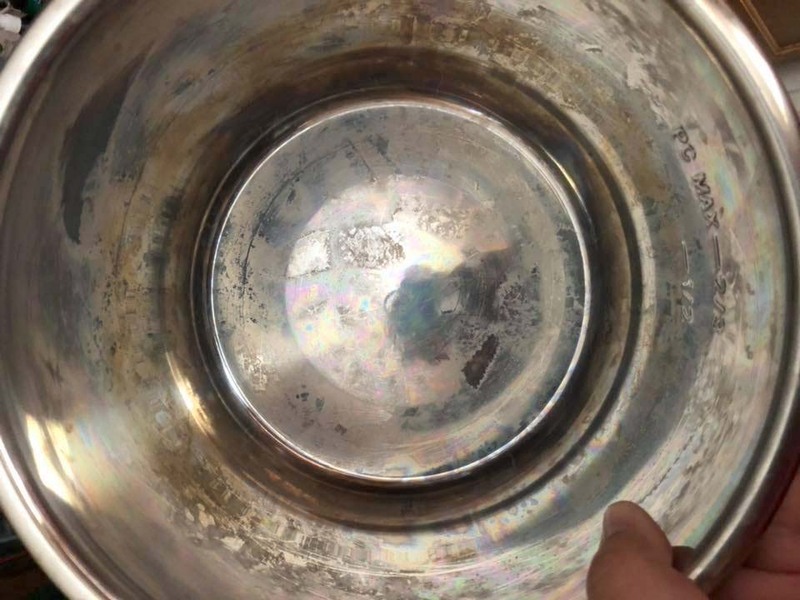 The sugars had burned onto the bottom of my pot, and I was afraid it'd be permanent. Soaked the pot in hot, soapy water. For two days. Added water to the pot, putting the pot on the Saute Normal of the pressure cooker for 30 minutes and scraping it with a metal spatula. Sprinkled Bar Keepers Friend cleaner to the pot, scrubbing it with a nylon scrubber. Nada. Tried the SOS pad with a little bit of water. Auuuggghhh!! The SOS pad, metal spatula, inner pot on Saute Low. Used the metal spatula on top of the SOS pad to scrub the black goo loose. A steel wool pad will leave scratch marks, but I was desperate. Not to worry, this is common. Minerals and salt, found in the food and your water, is to blame. Not your dishwasher. White vinegar, lemon juice or Bar Keeper's Friend. Put enough vinegar to cover the pot and let it sit for 5 minutes. Swish it around dump and rinse the pot. 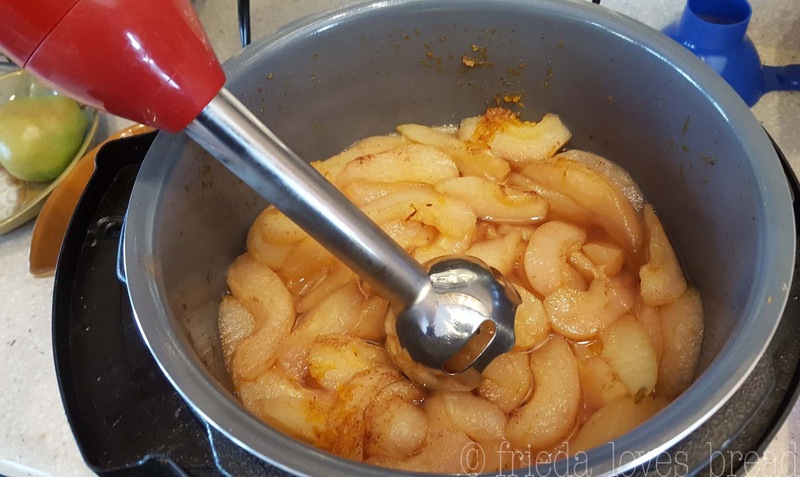 You can also use a sponge that is soaked in white vinegar or lemon juice and wipe the sides of the pot. 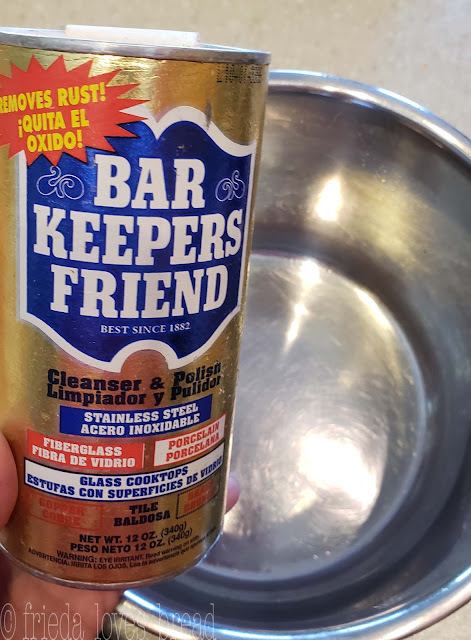 Bar Keeper's Friend it is a powdered cleanser and polish that works great on stainless steel and other surfaces. The base holds the heating element and cannot to be immersed in water. 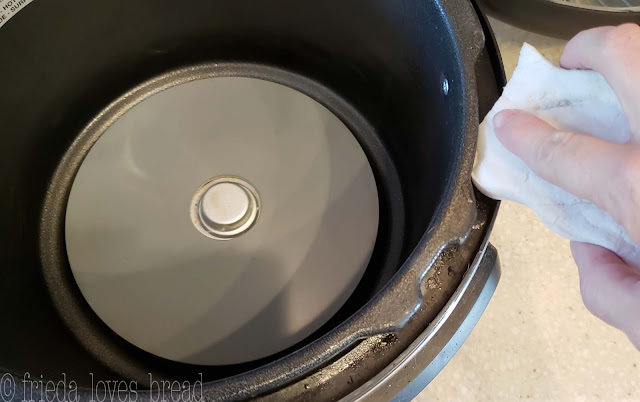 If this happens or liquid accidentally is poured into the pot WITHOUT the stainless steel inner pot, allow it to dry completely and contact Instant Pot Customer Service. 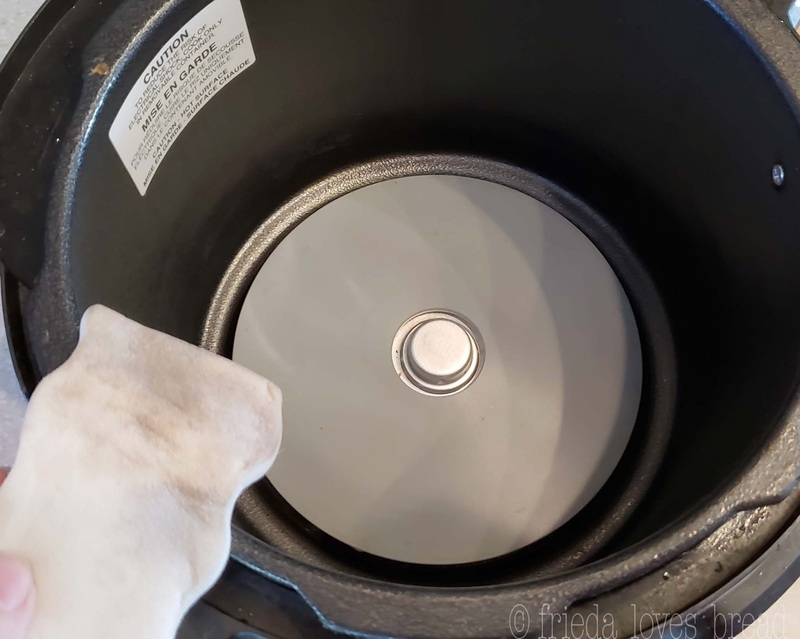 The heating element is this large, gray circle with a "button" in the middle. No matter how clean the exterior of my stainless steel pot is, somehow, I get these brown spots on the heating element. Mr. Clean Magic Eraser works wonderfully for this. 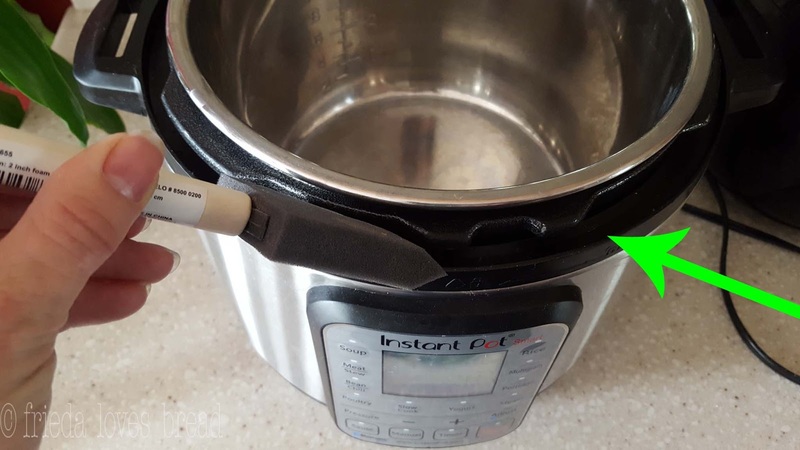 Make sure your Instant Pot is unplugged and has cooled down. Simply run the white Mr. Clean eraser under water, squeeze almost dry, and begin rubbing the heating element until it is clean. This is the most challenging part to clean, but with the right tools, it can be a breeze. dishcloth around a kitchen butter knife will work in a pinch. The condensation cup is *not* part of the Lux model. 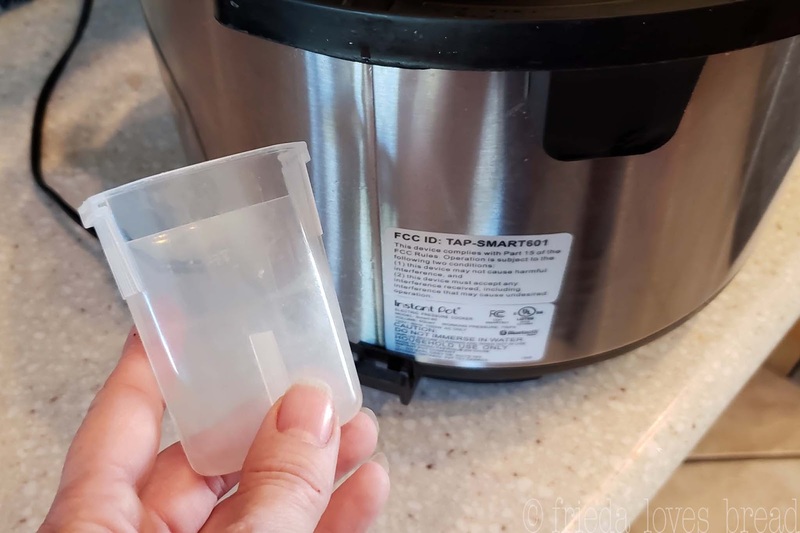 You will want to check your condensation cup each time you use your Instant Pot, especially when making soups or recipes containing a lot of liquid. Empty out the condensation cup and wash with hot soapy water, or put in on the top rack of your dishwasher. The lid is dishwasher safe. 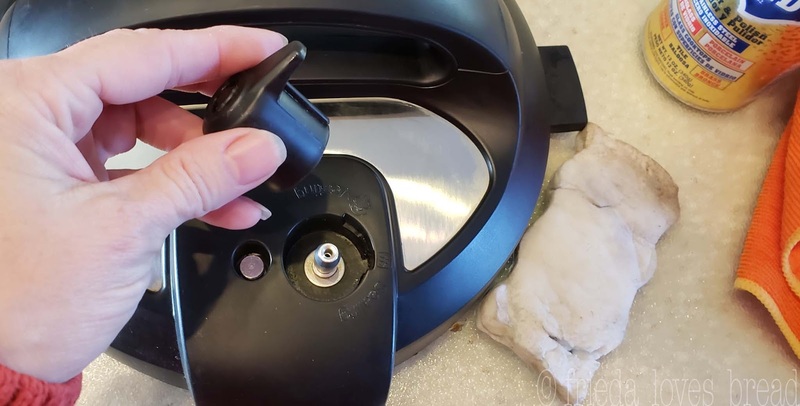 Repeated dishwasher use can cause the black finish to fade, so to keep my Instant Pot looking new, I prefer to hand wash my lid using my OXO dish brush, which has a permanent spot near my kitchen sink. You can remove the Anti-Block shield from the underside of the lid, wash with warm soapy water, rinse and wipe dry. Under the Anti-block shield is a silicone cap that holds the float valve in place. I don't remove and clean this unless I have food or foam spew out of the pressure valve. If you find that your float valve doesn't drop within a reasonable amount of time during a NPR (natural pressure release), it may be time to clean the float valve. Carefully remove the silicone cap, put it in a cup or safe place and the float pin will fall out from the lid. Put this float pin in a safe place as well, so it does not get lost. Use a pipe cleaner inserted in the hole to clean it out. Replace with the float pin and secure it with the silicone cap. This part only needs cleaning if you have had food spray through the pressure valve. 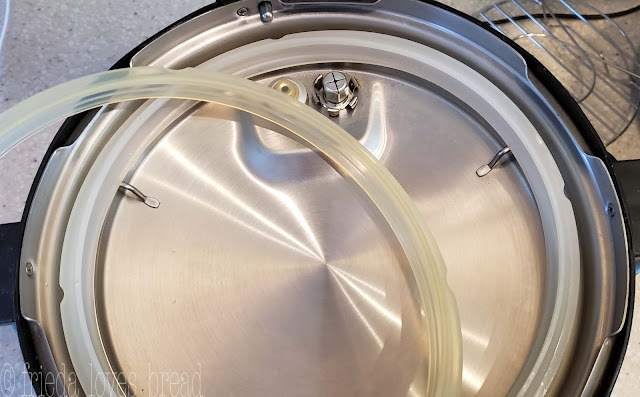 Simply pull the pressure valve off, rinse in hot soapy water and put a pipe cleaner or drinking straw brush through the small hole in the lid. The silicone seal is dishwasher safe, but the biggest problem is that it can SMELL. If you cook spicy foods, the seal can retain the color and odors of your food, and impart the smell into your foods. For example, you make a spicy chili one day and use your pressure cooker to make rice. You notice that your rice has a slight chili flavor. This can be true when using the seal to make yogurt. Yogurt doesn't use the pressure cooking setting, so you can use any lid, dinner plate or silicone suction lid for making yogurt. Why does this happen? When silicone gets HOT, the molecules expand and allow smells from the food to get trapped inside. 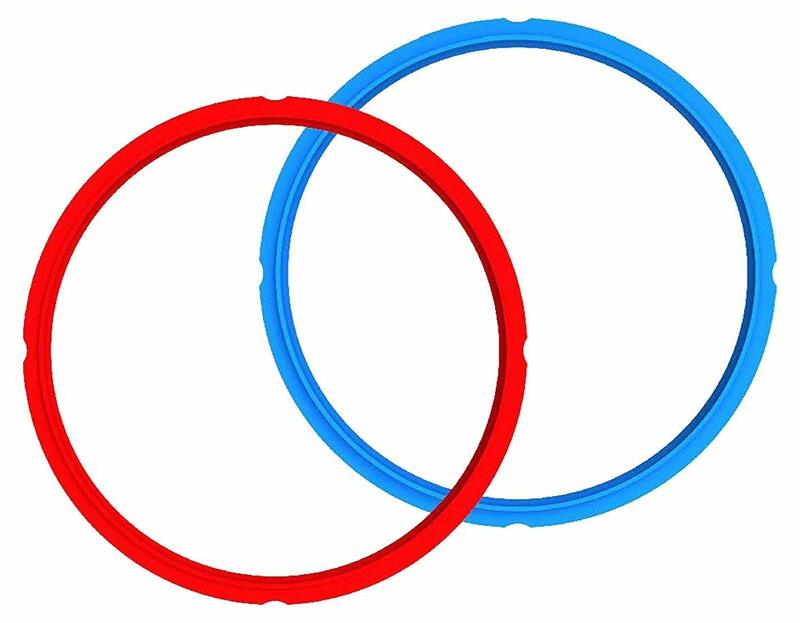 I have two silicone seals. The one on the left is my SAVORY seal and the one on the right is my SWEET seal. Instant Pot now has them available in Red & Blue! 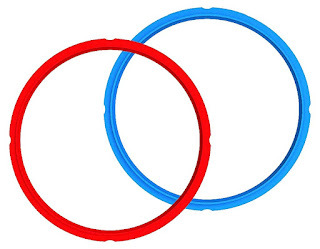 The red seal can be for SPICY and the blue seal can be used for SWEET foods. Bake a large potato for 25 minutes on high pressure, natural release. 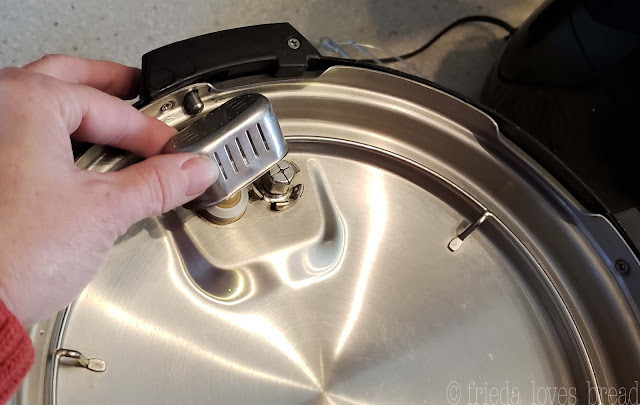 Put 2 cups white vinegar, lemon rinds, in stainless steel insert; Cover, select Steam for 2 minutes with a quick release. Rinse and air dry. Hydrogen peroxide recipe: 1 cup hydrogen peroxide, 1 Tablespoon Dawn dishwashing detergent, 2 Tablespoons baking soda, 1 cup of water into a large Ziploc bag. Add seal/ring, close bag and let it sit overnight. Rinse, air dry. If all else fails, purchase another seal to use for cheesecakes, yogurt, creme brulee, etc. TIP: Store your seal inside the lid, with the lid upside down. This airs out the seal and keeps odors at bay in between cooking. And finally, use a soft cloth to clean the outside of your Instant Pot and display. Enjoy your sparkling clean Instant Pot! I've made the yogurt twice. The first time I did not strain and it was plenty thick. Considering I'm a Fage can, this says a lot. I used 2 cups of have cream. The second time I used the 16 oz Natural Bliss Sweet cream and I felt I had to strain. It came out sweet, and I prefer my yogurt plain and a little Great. Therefore, I will continue to use the heavy cream. I used Fage Total for starter. Thanks for all the fabulous cleaning tips. I haven't figured out how to remove my seal ring. I've been hand washing the lid. I also use Mr.clean magic eraser and no doubt it works very well, Thanks for the review, though.